Continuous nuclear power plant consists of units housed in separate buildings, is a monoblock. Each candy bar is made up of the reactor building, machine room, deaerator room and control room facilities. Reactor compartment is designed to accommodate a nuclear installation and auxiliary equipment. The building of the reactor compartment is a monolithic reinforced concrete structure, it includes a sealed protective envelope and obstroyki situated around the shell. Dimensions of the building up 66h66 m, obstroyki top marker corresponds to 49.800 m Building obstroyki reactor compartment -. Multistory structure is made of precast reinforced concrete. Applies concrete class B15 and B20, fittings AI and AIII. A sealed protective sheath is designed to prevent or limit the spread of radioactive substances or emissions released during crashes. 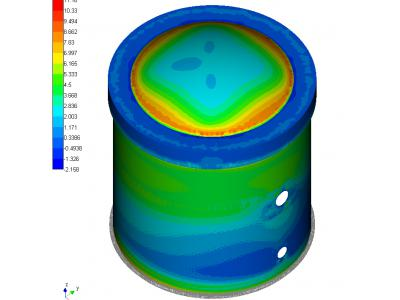 The containment shell is a sealed volume, consisting of a vertical monolithic reinforced concrete prestressed cylindrical portion and a spherical dome prestressed. The diameter of the cylindrical part of - 47.4 m, the top containment mark corresponds to 66.450 m is applied concrete grade B30, AI fittings and AIII.. Calculation of buildings and structures, taking into account the seismic load is made according to the requirements established by the relevant regulations - 14.13330 joint venture for the Russian Federation and Ukraine DBN V.1.1-12-201. In accordance with these set loads, load combinations and calculating for calculating characteristics of seismic stability boundary (HCLPF). CAD system of building civil and industrial use APM Civil Engineering allows you to build a model, reliably describing the geometry and behavior of real structures with subsequent calculation of the finite element method. In constructing the rod members are used (beams, cables, pipes), and a four trehuzlovye plate members, and volume 4, 8, 10-nodal finite elements. 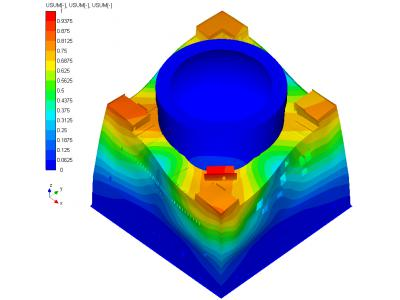 Estimate Module APM Structure 3D, belongs to the software system that allows to count the stress-strain state of a structure for static and dynamic loading, to perform the calculation of stability, the natural frequencies and forced oscillations, and other calculations. Seismic feedback calculation is linearly spectroscopic method spectra using horizontal and vertical accelerations. 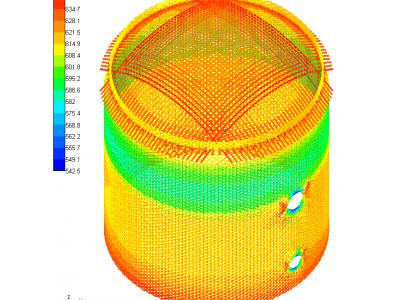 The APM Structure 3D it is possible to perform layout design and verification calculations of reinforcement in the construction, crack resistance, calculation of the first and second group of limiting states. APM Structure 3D module has a qualification certificate №330 of April 18, 2013, issued by Rostekhnadzor, as well as a certificate of compliance regulations such as the joint venture 20.13330, 14.13330 JV, SP.15.13330, SP16.13330, CP-52-101, CP-50 101, SP-50-102. 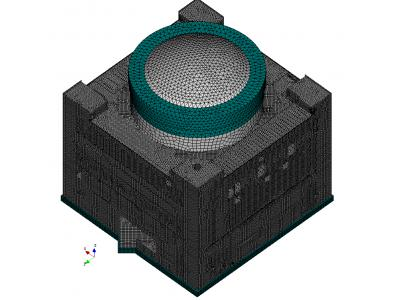 In the construction of the computational model of the building used separation reactor plate elements for walls, ceilings, roofs and the foundation plate, rod members for columns inside containment and volume elements for the reactor shaft. Figure 1 shows a finite element model of the building of the reactor compartment. 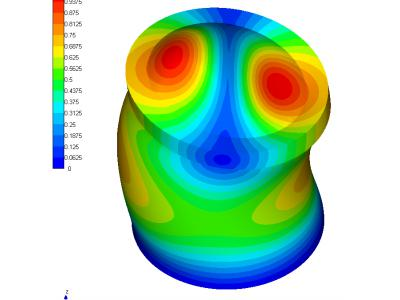 The calculation were obtained stress distribution maps and displacements in the structure elements (Figure 2), the natural frequencies and mode shapes (Figure 3). 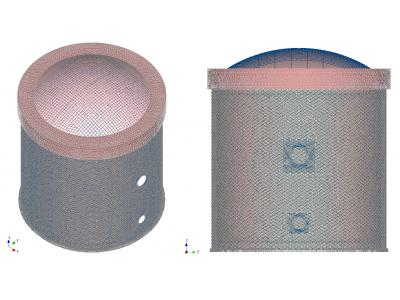 When constructing a computational model used for finite element plate and the cylindrical part of the containment dome, volume elements for the annular eaves used, and for reinforcing ropes - the final element of the "rope". 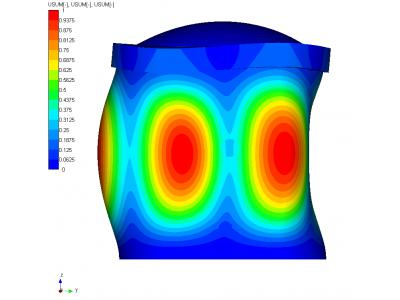 Figure 4 is a finite element model of the containment of the reactor compartment. As a result of calculating the distribution of stresses and displacements in the map structure elements (Figure 5) were obtained, its own frequency and waveform (Figure 6). From the calculation results of the findings were made on the strength of the building of the reactor compartment under seismic actions according to the requirements of building codes in seismic regions. 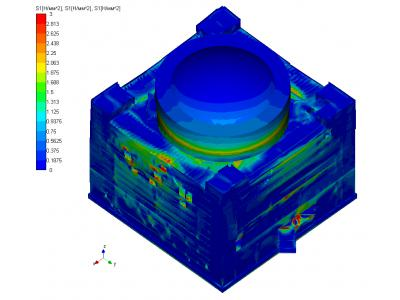 The results show that computer-aided design of construction of civil and industrial use APM Civil Engineering can be used for calculations of buildings and structures on the seismic effects.